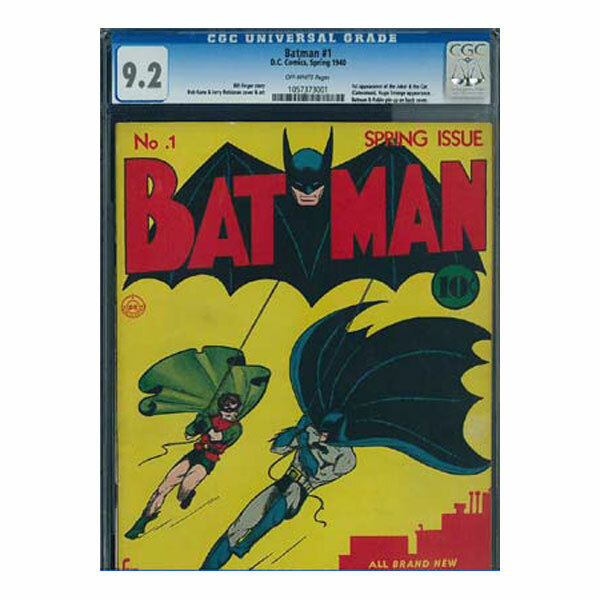 A CGC universal grade example of the most sought-after golden age comic book Batman #1 from 1940, CFC-Grade 9.2 has been sold for $850,000 in a private transaction through the Heritage Auctions ComicMarket. The Overstreet Comic Book Price Guide lists Batman #1 as the 6th most valuable Comic Book in NM- condition. It’s amazing that three years ago, no comic book had ever sold for even half that amount, said Ed Jaster, Vice President of Heritage Auctions, which brokered the sale. Heritage is holding a $4+ million comics and comic art auction in Dallas May 10-11. Many collectors and dealers will be watching to see how Golden Age comics perform there. Batman #1 was published in 1940 and written by Batman creators Bob Kane and Bill Finger. The value of Batman #1 is probably influenced by the following facts: Batman #1 is famous for introducing the Joker and Catwoman to the world. It is, however, their first appearance, and one of the earlier appearance of Hugo Strange (whose first appearance was in Detective Comics #36 as the villain). Further, it is the best copy of this comic graded by the Certified Guaranty Company, the industry’s 3rd-party grading service. This is the sole copy of Batman #1 graded Universal 9.2 by CGC, with none graded higher. There are currently two copies graded CGC 9.0, and three copies graded CGC 8.5. Superman’s debut in Action Comics #1 holds the auction record for a comic book, selling for $2.1 million in 2011.